THIS IS IT !! THE HOME YOU'VE BEEN LOOKING FOR. 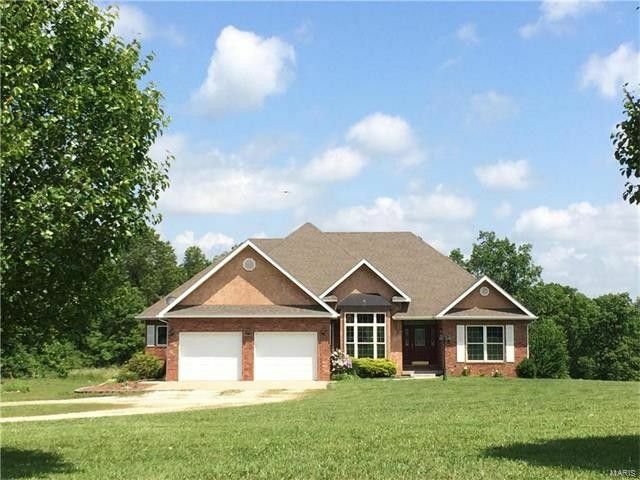 THIS STUNNING CUSTOM BUILT BRICK HOME ON 3 ACRES IS MINUTES FROM TOWN. IT HAS A VERY OPEN STYLE FLOOR PLAN WITH BEAUTIFUL HARDWOOD FLOORS AND LARGE WINDOWS ALLOWING GREAT NATURAL LIGHTING. THIS 3 BEDROOM 2.5 BATH HOME HAS TWO LIVING AREAS, VERY LARGE LIVING ROOM & FORMAL DINING ROOM. THE KITCHEN HAS BRIGHT WHITE KITCHEN CABINETRY WITH GRANITE COUNTERS, DOUBLE WALL OVEN, PANTRY. THE HEARTH FAMILY ROOM HAS A GAS LOG FIREPLACE AND BUILT IN BOOKCASES AND IS OPEN TO THE KITCHEN AND BREAKFAST AREA. DOUBLE GLASS DOORS ACCESS TO THE COVERED REAR CONCRETE PATIO-PORCH. THIS HOME HAS A SPLIT BEDOOM PLAN, THE MASTER HAS DOUBLE VANITY, 2 WALK IN CLOSETS, WALK IN SHOWER AND A CORNER JETTED TUB. THE CEILINGS ARE 9FT + AND ARE RECESSED WITH CROWN MOLDINGS. BEAUTIFUL CUSTOM TRIM THROUGH OUT. LARGE LAUNDRY AREA W/PANTRY AND ROOM FOR A FREEZER. NEW SHINGLES & HEATING SYSTEM IN 2016 HEAING SYSTEM. LARGE CIRCLE DRIVEWAY. VERY PRIVATE REAR SETTING.